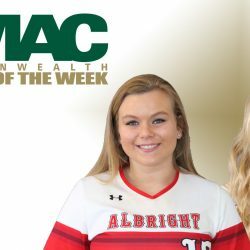 ANNVILLE, Pa. – Camille Sears and Riley Gerenda swept the MAC Commonwealth Softball Players of the Week awards, announced on March 26. Sears earned Player of the Week while Gerenda was named Pitcher of the Week. Sears had the two biggest hits for Albright in its doubleheader sweep of Lycoming on Saturday. In game one, Sears hit a two-out double to score the go-ahead run in a 4-3 victory. In the eighth inning of a scoreless game two, Sears homered to center field with one out to provide the lone run in a 1-0 victory. It’s her first career home run. Gerenda allowed just seven hits in 15 innings of work in the Lions’ doubleheader sweep. In game one, she allowed three runs, two earned, in the team’s 4-3 victory. She struck out four and only walked one. In game two, Gerenda carried a no-hitter into the fourth inning on her way to an eight-inning shutout. She again struck out four, and she didn’t allow a runner past second base in the contest. The Lions return to action at home against Lebanon Valley on Tuesday, March 27. The doubleheader begins at 3 p.m.